Sound familiar? Embed from Getty Images This is by no means the first time that Francis has denied or relativized Christ Jesus the Lord, the Eternal Word (see Jn 1:1). When he visited the synagogue in Jerusalem earlier this year, Francis happily covered the pectoral cross he wears, lest the Jews, who deny that Jesus Christ is the Messiah, be offended at the sight of their loving Redeemer. In fact, the interfaith prayer meeting that took place at the Vatican Gardens on Pentecost Sunday was originally scheduled to take place inside St. Peter’s, yet was moved outside as the Jews did not want to enter a place in which crucifixes are visible. Is the Novus Ordo Church of Christ, ladies and gentlemen, or of Antichrist? In fact, “Cardinal” Walter Kasper, when addressing his fellow Novus Ordo “cardinals” in February of this year to kick off debate on this topic, made reference to this Ratzinger essay from 1972. In Germany, the multi-volume Gesammelte Schriften (“Collected Works”) of Joseph Ratzinger are currently being published, and the most recent volume to be released is Vol. 4, which includes the infamous 1972 essay. But now it gets interesting: The essay has been revised from its original form and now draws a different conclusion, though leaving the original arguments the same. The German Süddeutsche Zeitung has written an interesting article on Ratzinger’s reworking of his original essay. We present it in translation and also offer some more commentary, below. The following video provides an excellent 10-minute audio-visual comparison of the Holy Catholic Mass of the ages — aka the “Traditional Latin Mass” — with the 1969 Novus Ordo Missae promulgated by the False Pope Paul VI, a rite that even then-“Cardinal” Ratzinger admitted was a “banal on-the-spot product” yet which he claimed later as “Pope” Benedict XVI was “one and the same rite” with its Traditional Latin counterpart. It’s time to look the facts in the eye and consider what has really happened to the Catholic Church since the Second Vatican Council, or, more precisely, since the death of Pope Pius XII in 1958 and the bizarre events that unfolded afterwards. If you’re wondering where to go and what to do, take heart. Do not be afraid. Our article “Now What? !” provides hope and consolation. May God bless you.“Blessed”? My Eye! [UPDATE: Did Ratzinger retract his essay in 2014? Not Quite — the facts here: Benedict XVI weighs in on Communion Debate] At a time when sparks are flying ahead of the controversial Synod on the Family that “Pope” Francis has scheduled to begin on October 5, 2014, we thought it would be a good idea to share once more with our readers — as we already did in March of this year — the little-known fact that among the very first “Catholic” theologians to try to find a way to permit public adulterers (the “divorced-and-remarried” in the Vatican II Church that didn’t manage to get an annulment) to receive the Novus Ordo sacraments was none other than the suit-and-tie Modernist Fr. Joseph Ratzinger, suspected of heresy under Pope Pius XII, who became “Pope” Benedict XVI in 2005. About six years after the close of the the Second Vatican Council, at which he helped direct the Modernist revolutionary program, Fr. Ratzinger wrote an essay on this topic that was published in a book on holy matrimony and divorce. 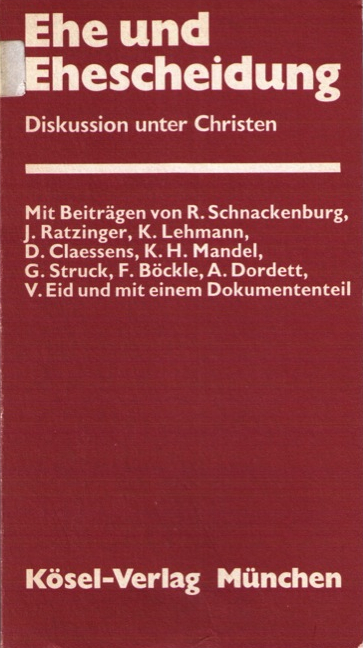 The book in question is Ehe und Ehescheidung: Diskussion unter Christen [Marriage and Divorce: A Discussion among Christians], edited by Franz Henrich and Volker Eid, published in Munich in 1972 by Kösel-Verlag. Ratzinger's essay is entitled Zur Frage nach der Unauflöslichkeit der Ehe: Bemerkungen zum dogmengeschichtlichen Befund und zu seiner gegenwärtigen Bedeutung [On the Question of the Indissolubility of Marriage: Remarks on the Dogmatic-Historical Facts and their Present-Day Significance] and is printed on pp. 35-56. So, let’s set the record straight once and for all here: Benedict XVI does not believe there is still some major event to come: not the consecration of Russia, not the conversion of Russia, and not the triumph of the Immaculate Heart in any sense in which traditional Catholics typically understand these terms. Rather, he is on the record clarifying that for him the message of Fatima is only “not a thing of the past” “in this sense”, namely, that “the transformation of the heart — through faith, hope, love, and penance” is still needed today in response to “the whole power of evil” which “is still at work today” so that “the Church continues to suffer, and a threat still hangs over man.” Likewise, Benedict XVI clarified that his hope for the “fulfillment of the prophecy of the triumph of the Immaculate Heart of Mary” simply means, not an expectation that “there is going to be a huge turnaround and that history will suddenly take a totally different course” — for he admits to being too much of a rationalist for that — but rather, a mere prayer that there would be “enough righteous men” who “regain their vigor” so as to “repress evil and destruction”. Whoop dee doo. That’s all there is to it. So, let’s keep this cold, stark reality in mind for next time someone brings up the argument that “Benedict XVI said Fatima is not yet over and the Triumph of the Immaculate Heart is still to come”. This claim that Ratzinger gave some mystifying signal about a future Fatima-related event, once insinuated by Rorate Caeli and claimed by Antonio Socci and Chris Ferrara, and recently recycled at the One Peter Five web site, is sheer nonsense; it needs to stop. It simply doesn’t correspond to the facts. True devotion to our Lady of Fatima and to the Immaculate Heart of Mary — which we certainly cultivate and encourage — is not legitimately served by perpetuating wishful thinking. May Our Lady of Fatima intercede for us and hasten the day of her genuine triumph, when the false Vatican II Church will finally be but a distant memory and the true Catholic Church once again shine forth gloriously with a true Pope as the legitimate shepherd of all Catholics. 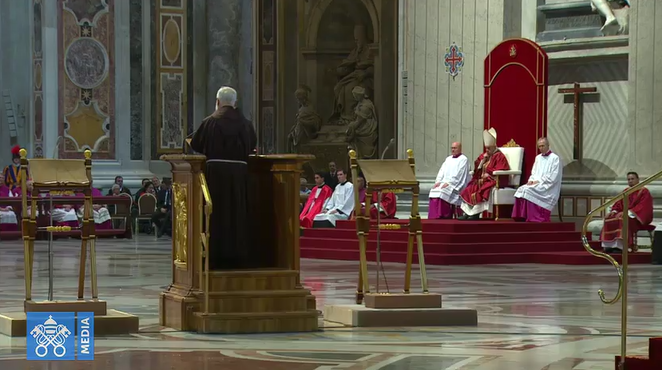 So, what is Benedict XVI decreeing in Summorum Pontificum? He is decreeing that, effective September 14, 2007, the 1962 Missal become what he calls the “extraordinary form” of the “one Roman rite,” of which the “ordinary form” — you guessed it — is the 1970 Novus Ordo “Mass.” Benedict claims that there exists no rupture between the two rites, that both of them are authentic rules of prayer (lex orandi) and therefore properly express the law of belief (lex credendi). With certain restrictions here and there, the 1962 Missal may be used rather liberally in the New Church. The same goes for administering other sacraments in their pre-Vatican II form (baptism, penance, confirmation, holy matrimony, and “anointing of the sick,” i.e. extreme unction). To summarize: This is to be done by allowing any priest of the Novus Ordo church in good standing to offer Mass according to the 1962 Missal without the permission of the local bishop, if the Mass is said privately, that is, without people in attendance. This may be done on any day except Holy Thursday, Good Friday, and Holy Saturday (the “Easter Triduum”), on which days the liturgy cannot be offered privately but must be public (any such public celebration, however, is subject to the approval of the local ordinary). In Novus Ordo parishes where there is a “stable group” that is “attached” to the 1962 Missal, the pastor is “urged” or “encouraged” to allow such Masses even for the public, taking care that these people remain part of the parish and under the local bishop. This is basically the “meat” of the motu proprio, though there is more to it and more legal technicalities are established, which, however, are beyond the scope of this analysis. Benedict’s intent is to make Traditionalists an “offer they can’t refuse.” Unfortunately, now that seven years have passed, it is clear that many have fallen for it: Praise for Summorum Pontificum is heard from numerous quarters even though the document itself and the accompanying explanatory letter are very dangerous and wholly unacceptable, as we shall see now. I will wash my hands among the innocent; and will compass thy altar, O Lord: That I may hear the voice of thy praise: and tell of all thy wondrous works. I have loved, O Lord, the beauty of thy house; and the place where thy glory dwelleth. Take not away my soul, O God, with the wicked: nor my life with bloody men: In whose hands are iniquities: their right hand is filled with gifts. But as for me, I have walked in my innocence: redeem me, and have mercy on me. My foot hath stood in the direct way: in the churches I will bless thee, O Lord. Glory be to the Father, and to the Son, and to the Holy Ghost. As it was in the beginning is now and ever shall be; world without end. Amen. Wherefore, O Lord, we, Thy servants, as also Thy holy people, calling to mind the blessed passion of the same Christ, Thy Son, our Lord, His resurrection from the grave, and His glorious ascension into heaven, offer up to Thy most excellent majesty of Thine own gifts bestowed upon us, a victim which is pure, a victim which is stainless, the holy bread of life everlasting, and the chalice of eternal salvation. Vouchsafe to look upon them with a gracious and tranquil countenance, and to accept them, even as Thou wast pleased to accept the offerings of Thy just servant Abel, and the sacrifice of Abraham, our patriarch, and that which Melchisedech, Thy high priest, offered up to Thee, a holy sacrifice, a victim without blemish. We humbly beseech Thee, almighty God, to command that these our offerings be borne by the hands of Thy holy angel to Thine altar on high in the presence of Thy divine Majesty; that as many of us as shall receive the most sacred Body and Blood of Thy Son by partaking thereof from this altar may be filled with every heavenly blessing and grace: Through the same Christ our Lord. Amen. Traditional Missal (as last revised by Pope Pius XII in 1955): Let us pray also for the faithless Jews [“faithless” removed from 1962 Missal --N.O.W. ]: that almighty God may remove the veil from their hearts; so that they too may acknowledge Jesus Christ our Lord. Let us pray. Let us kneel. Arise. Almighty and eternal God, who dost not exclude from thy mercy even Jewish faithlessness: hear our prayers, which we offer for the blindness of that people; that acknowledging the light of thy Truth, which is Christ, they may be delivered from their darkness. Through the same our Lord Jesus Christ, who liveth and reigneth with thee in the unity of the Holy Spirit, God, for ever and ever. Amen. 1970 Novus Ordo Missal: Let us pray for the Jewish people, the first to hear the word of God, that they may continue to grow in the love of His Name and in faithfulness to His covenant. Almighty and eternal God, long ago You gave Your promise to Abraham and his posterity. Listen to Your Church as we pray that the people You first made Your own may arrive at the fullness of redemption. We ask this through Christ our Lord Amen. No doubt, Paul VI's new definition, just like the New Mass itself, is “one and the same” with the traditional definition! This shows how gullible they believe people to be. It is an insult to Catholics’ intelligence. Did Paul VI “Illegally Promulgate” the Novus Ordo Mass? In fact, the 1962 Mass was known as the “Indult Mass” between 1984 and 2007 for the very reason that this special permission was required to be allowed to offer it. (The 1984 document Quattuor Abhinc Annos was the first Vatican concession of an indult for groups of people “attached” to the old Missal, though it had severe restrictions; the second, wider indult came in John Paul II’s 1988 motu proprio Ecclesia Dei.) But if the 1962 Missal was never abrogated, as Benedict XVI now so nonchalantly claims is a “fact,” then why was it necessary first to obtain a papal indult before one was allowed to use it? Some might object that in his letter Benedict merely says the 1962 Missal was always permitted “in principle.” But what does he mean by this qualification? Is he suggesting that it was permitted in theory but not necessarily in practice? Of what value and significance is a theoretical authorization that does not have practical effects? Is a merely “theoretical” permission not a completely meaningless concept, anyway? When we thus examine the legislative history of the Novus Ordo Missae, we find that Benedict’s idea that the traditional Missal was never in fact suppressed, is simply not true. It is an assertion he fabricated to make it easier to introduce his universal indult. …[I]n many places celebrations were not faithful to the prescriptions of the new Missal, but the latter actually was understood as authorizing or even requiring creativity, which frequently led to deformations of the liturgy which were hard to bear. I am speaking from experience, since I too lived through that period with all its hopes and its confusion. And I have seen how arbitrary deformations of the liturgy caused deep pain to individuals totally rooted in the faith of the Church. And all this coming from a man who himself offered some of the most absurd and exotic high-profile “Eucharistic liturgies” in the life of the Vatican II Church, including Hindu dancers and bare-breasted women, for example. Please pardon anyone who is not exactly convinced by this “bewailing” of abuses in the Novus Ordo. So, you get the picture: By lamenting liturgical abuses in his 2007 letter to his bishops, Benedict XVI is simply continuing a trend begun long before him. Don’t believe for a minute that there is real concern here regarding how the worship of God is conducted in the Novus Ordo Church. If there were, “Cardinal” Schonborn of Vienna, Austria, would have been removed from his position after he presided over this “liturgical” nightmare. What would you think of a president who claimed to be pro-life and complained about abortion every now and then, but then turned around and appointed pro-abortion judges all over the place and perhaps even selected an abortionist as his surgeon general? Would you say such a man’s tears shed about the evil of abortion are sincere? Of course not. And Benedict’s “sadness” at the Novus Ordo “abuses” is just as pretended. He wonders why many Novus Ordo priests have understood the New Missal “as authorizing or even requiring creativity” — perhaps it is because the new liturgy itself is so banal and dumbed down, it cries out for something substantial, something that gives it shape, something that makes it take on some kind of identity. Besides, it lends itself perfectly to being “abused” — precisely because, as Ratzinger himself has said, it is a “banal, on-the-spot product” with a sheer endless supply of different “options” to choose from, each resulting in a different liturgical “experience.” All this was ultimately brought on by Paul VI and Vatican II, who did not want to leave the “liturgical richness” of the New Mass hidden any longer in the dark libraries of the Vatican. This, incidentally, is one way by which we know that the Modernists in Rome are deliberate and malicious in their destruction of Catholicism: Even when the bad fruits are really apparent, they still refuse to uproot the cause of the evil. Even if Paul VI had innocently meant to truly enrich the Catholic liturgy so that more abundant fruit could be drawn from it, by the end of his “pontificate” about ten years later, he would have reverted back to the Traditional Mass and condemned the Novus Ordo as a complete disaster, because by then the awful fruits were entirely apparent. This didn’t happen, of course, and the reason is obvious: Paul VI meant for the New Mass to destroy the Faith. Similarly, in 1988, John Paul II “lamented” the fact that some “have promoted outlandish innovations, departing from the norms issued by the authority of the Apostolic See or the bishops, thus disrupting the unity of the Church and the piety of the faithful and even on occasion contradicting matters of faith” (“Apostolic Letter” Vicesimus Quintus Annus, n. 11). What did he do to stop this rending of the unity of the Church and deriding of the piety of the faithful? Nothing, of course. Instead, he then allowed altar girls and so made it worse. The simple truth is that the “outlandish innovations,” for the most part, first came from the Vatican itself, courtesy of the “Great Renewal” of John XXIII and his successors of unhappy memory. Further in his letter to the world’s bishops, Benedict XVI states that he is granting this special indult for greater use of the 1962 Missal because so many people, both young and old, have an “attraction” to this liturgical “experience.” He completely ignores the fact that the real Traditionalists do not insist on the Traditional Mass for reasons of nostalgia, experience, or feeling, but for reasons of the Catholic Faith. The Traditional Mass expresses perfectly and very beautifully the True Creed that has since been falsified by Vatican II (hence the need for a New Mass, and hence the great opposition of so many Modernists to the Traditional Mass or even the 1962 Mass, as we already mentioned). It is because the Traditional Mass renders a fitting, uncompromising, and unadulterated worship to the Most Holy Trinity, approved by true Catholic Popes, that Traditionalists will only assist at this Mass. It has nothing to do with nostalgia or Latin per se. It’s not because of some “encounter with the mystery of the most holy Eucharist” that we feel is “particularly suited” (Benedict’s words) to us that we refuse to worship at the New Mass and only assist at the Tridentine Mass. But Benedict, in typically Modernist fashion, reduces everything to subjectivity, feeling, and personal experience. Pope St. Pius X warned us against precisely this in his landmark encyclical against Modernism 107 years ago: “…[E]verything in their system is explained by inner impulses or needs” (Encyclical Pascendi Dominici Gregis, n. 21). Who, then, has been swayed by Ratzinger’s gesture? Only the False Traditionalists, those who do not really care where a Traditional Mass is said, or who offers it, what Missal is used, etc. — in other words, those who are merely focused on the externals. They have jubilantly accepted his offer because to them, what matters primarily is not the Faith but external celebration. As long as the Latin is eloquent, the vestments are beautiful, the candles are long enough, and the incense smells right, they “feel” at home and willingly give themselves to the illusion that they are being traditional Catholics. But any genuine Catholic rejects such pharisaical Modernist charades, which only exist to lure battle-weary Traditionalists into the New Church; they are the Forbidden Fruit that seems beautiful to behold and sweet to the taste. It is reason and Divine Revelation that tell us what is right and wrong, however, not emotion. Ratzinger can keep his nostalgia nonsense; true Catholics do not fall for it. On Talmudic Judaism (as opposed to the Judaism of the Old Covenant, which ceased with the promulgation of the Gospel): “…our roots are in Judaism. Approximately four weeks after the close of part one of the infamous Synod on the Family, the retired “Pope” Benedict XVI now adds some fuel to the inferno. Though he once promised to withdraw completely from ecclesiastical affairs, he somehow always manages to make himself heard whenever he so chooses, even if usually in an indirect or even cryptic way. This time, Joseph Ratzinger has chosen to weigh in on the debate over whether public adulterers (the “divorced-and-remarried”) should be allowed to receive the Novus Ordo sacraments, which is one of the core issues currently under discussion in the Novus Ordo Sect’s ongoing synod of bishops, part two of which is scheduled to take place in October 2015. Not only does Paul VI’s Novus Ordo Missae (“New Order of Mass”) represent a substantial change in Catholic belief and practice, it is also definitely invalid in most vernacular tongues, specifically in English, as was proved as early as 1968 — even one year before it was imposed as an official rite — by the late Patrick Henry Omlor (+2013). The Modernists in the Vatican are laughing at all you people who believe they are legitimate Roman Catholic authorities. Giovanni Battista Montini (“Pope” Paul VI) was the single one figure in Church history most responsible for creating/shaping the apostate Vatican II Sect in Rome. Vatican II was his council (he’s the only “Pope” who signed its documents). The Novus Ordo Missae was his “Mass.” The New Sacraments were his rites, most notably the new ordinations, which are invalid and confer no grace and make no priests or bishops (see details here). At a time when sparks are flying ahead of the controversial Synod on the Family that “Pope” Francis has scheduled to begin on October 5, 2014, we thought it would be a good idea to share once more with our readers — as we already did in March of this year — the little-known fact that among the very first “Catholic” theologians to try to find a way to permit public adulterers (the “divorced-and-remarried” in the Vatican II Church that didn’t manage to get an annulment) to receive the Novus Ordo sacraments was none other than the suit-and-tie Modernist Fr. July 7 marked the seven-year anniversary of the release of Summorum Pontificum, the much-acclaimed “Apostolic Letter” Motu Proprio of “Pope” Benedict XVI. At the time, we published a critical examination of this document and its accompanying explanatory letter, warning traditionalists everywhere that the “Ratzinger Indult” was not what it seemed and put the Traditional Latin Mass on equal footing with the abominable Modernist Novus Ordo Missae of Paul VI, outrageously claiming that the two were simply two expressions of the same Roman rite! After about a year of rumors, on July 7, 2007, Fr. Joseph Ratzinger (“Pope Benedict XVI”) finally released an “Apostolic Letter motu proprio,” entitled Summorum Pontificum, on the use of the Roman Missal of 1962, the liturgical rite that is referred to by many as the “Traditional Latin Mass.” This document grants a fairly wide permission to priests in the Novus Ordo Church to use the 1962 Missal (of John XXIII) instead of the 1970 Missal (of Paul VI) for their celebration of Mass, though it does not do away with all conditions and restrictions, as we will see below.